Remember like 10 years ago when Chai tea lattes first became popular? They were all the rage in college, and for good reason. I don't particularly like hot tea - for whatever reason I feel like it's too bitter - but the latte I could get behind - syrup, milk, and whipped cream? I'm totally on board with that. And it just so happens that I love tea in desserts. While the bitterness is what makes me dislike drinking tea, it's actually what makes me like it in desserts. I know it sounds counterintuitive, but it somehow balances the sweetness and gives a nice complexity of flavor. 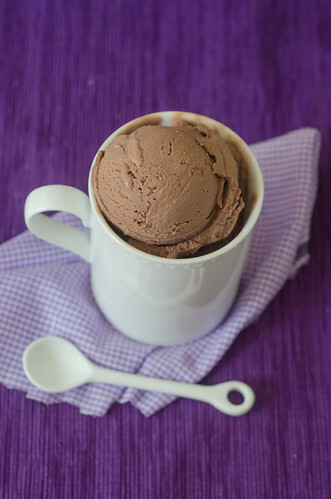 Anyway, I also love chocolate with cinnamon, so I knew that I would love this spiced chocolate ice cream. 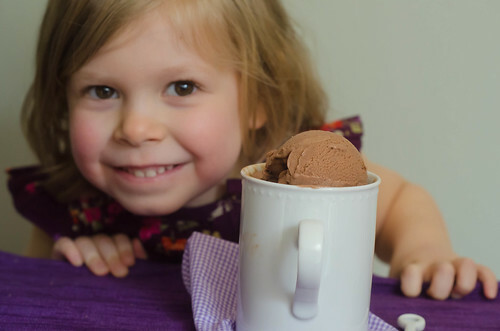 The spices of chai tea - cardamom, cloves, peppercorn, cinnamon, and star anise - just subtly infuse this impossibly smooth, ultra chocolatey ice cream. Because it uses milk chocolate instead of dark, the spices are able to be detected. I think if you used a darker chocolate, the tea would get lost in it. As it is, the spice is pretty subtle - just enough there to keep things interesting and make you wonder what exactly it is that makes this ice cream taste so good. In a medium saucepan, bring the cream, milk, sugar, and salt to a bare simmer - when the mixture just begins to bubble around the edges, remove from heat and add the tea bags, cover, and allow to steep for about an hour. To make the base, whisk the yolks in a medium heat-proof bowl and set aside. Place the chopped chocolate in another heat-proof bowl, and set that aside as well. Remove the tea bags from the saucepan, squeezing them to remove as much liquid as possible, and set the pan over medium-high heat. When the mixture just comes to a simmer, reduce the heat to medium. Carefully scoop out about 1/2 cup of the hot cream mixture and, whisking the eggs constantly, add the cream to the bowl. Repeat, adding another 1/2 cup of the cream to the yolks. Doing this allows the eggs to begin cooking slowly and making a custard, rather than scrambling them. Slowly whisk the egg-cream mixture into the saucepan. Cook the mixture over medium heat, stirring constantly with a rubber spatula, until it has thickened and coats the back of the spatula, about 1 to 2 minutes. Pour the mixture into the bowl of chopped chocolate, wash your whisk, and whisk until the mixture is smooth. Strain the mixture through a fine-mesh strainer into a clean bowl. Set the bowl into an ice-water batch, and stir the base occasionally until it is cool. Remove from the water bath, cover with plastic wrap, and refrigerate at least 2 hours, or overnight. Freeze in your ice cream machine according to the manufacturer's instructions. As the ice cream churns, put the container that you plan to use to store the ice cream into the freezer. Transfer the ice cream to the container and freeze for at least 4 hours before serving. I just love to eat ice-cream. I just want to try this recipe. Where can I get kosher salt in London? Excuse me. Chai...what?! This sounds & looks awesome. NOM. Love this flavor combination! Sounds incredible! I am a HUGE fan of chai..could drink the lattes nonstop!! So obviously I need this in my life. Mmmm, I used to love drinking chai. Since I'm an ice cream fanatic, this sounds perfect! I'm not a fan of tea, either, but this definitely sounds interesting! I'll have to give it a try! I made this icecream and absolutely love it! I think next time I'll only use two tea bags b/c the chai taste was a little overpowering, but still, soooo delish! Thanks for posting! I haven't made ice cream in FOREVER. Can I just say, holy cow this sounds amazing!